The Learnéd Owl has an entire section devoted to Fantasy authors, including me! 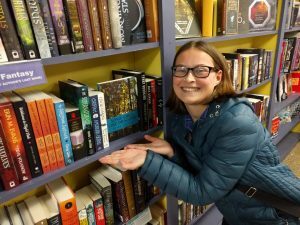 You can now find copies of Some Girls Like Dragons in the Science Fiction/Fantasy section. They can even fulfill your online order of Some Girls Like Dragons if you’re not in the area. The Learnéd Owl is located in the northern part of downtown Hudson. There’s plenty of free on-street parking so plan to stay a while and bring home lots of books. Stay tuned for an announcement for a book signing in late February 2017.